We first looked at video-streaming site Hulu about a year ago when it was operating on a private invite-only basis. In that time, the joint venture between NBC and Fox has opened to the public and expanded its offerings. In the process, it’s become one of the most prominent places for watching television online. The context has also changed since Hulu’s launch. At the time, NBC had pulled its content from the iTunes Store after a spat with Apple over pricing. The two companies patched things up and NBC reinstated its shows in the store last September, while also making HD downloads available through iTunes. Given that the crisis has passed, one might wonder if there’s even a point to Hulu anymore? The anwer is an unequivocal yes. Last year, I concluded that Hulu had a tough road ahead of it, with a field full of competitors like iTunes, YouTube, and illegal file-sharing. Despite that, the site has succeeded admirably, thanks largely to its ease of use and solid performance. Steve Jobs once said that the goal with iTunes was not to eradicate piracy but to compete with it by providing a better product, and it seems like Hulu has followed suit. Hulu and the iTunes Store might be competitors on the face of it, but the truth is that they fill two decidedly different niches. If you can bear with an SAT-style analogy, Hulu is to iTunes kind of like Netflix is to buying DVDs from Best Buy. More than anything else, Hulu’s target audience is the increasing number of people who don’t mind the existing model of ad-supported brodcast, but spend more time in front of their computer than in front of their TV. When Hulu launched, it had only a few TV shows, mostly from its two parent companies, and an extremely small catalog of movies. That’s changed radically since then, however, as the site has continually added both new and old shows to its roster; it now has dozens of shows from more than 50 content providers, including major television studios like Sony Pictures Television and the WB, though the lion’s share of programming still comes from Fox, NBC, and their subsidiaries. Though the catalog continues to fill out, there are definitely limitations. For example, a note on many series pages explains that the site can only offer up to five recent episodes. Often those episodes come back at the end of a season—for example, though I could only watch the most recent five episodes of NBC’s Life, the entire first season was available. That varies by show however—an episode of Fox’s Bones that I watched last year was no longer available. My favorite pastime with Hulu, however, has become watching cancelled series in their entirety, something for which it turns out Hulu is remarkably useful. Although Hulu lacks content from several of the major networks, it’s taken a page from Macy’s playbook, circa Miracle on 34th Street. If you search for a currently-airing show that isn’t in Hulu’s catalog, it may still bring up results for the program at another network’s site. For example, I searched for the CBS sitcom How I Met Your Mother, which isn’t available on Hulu, but the site still gave me a result for the most recent episode along with a link that offers to take me to CBS’s site to watch it. That’s a smart move, and it’s one designed to make Hulu feel like the place to go for television on the web. Plus, often times it’s faster than trying to find the same content on individual networks’ sites. The movie catalog has also expanded considerably. Last year, there were about 10 films on Hulu; today, there are more than a hundred. It may still be small potatoes compared to the number available on the iTunes Store, but if you compare it instead to the lineup of movies you might see flipping through cable TV channels it’s far more favorable. Hulu’s streaming nature also means that it has the ability to do some things that the iTunes Store can’t. 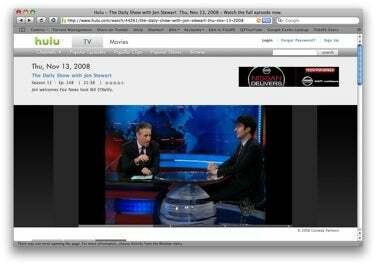 For example, in a first for the web, Hulu streamed the last two presidential debates live. Live events remain one of the major gaps in iTunes’s catalog, but it’s something for which Hulu is well-suited. While sports leagues like the NBA and NHL have not offered live games on the site yet, they do offer excerpts, clips, and even full games, albeit after the fact. It’s not hard to imagine a day when you’ll be able to stream your favorite sport on the web, for free. Of course, when I say free I mean free as in dollars. Hulu will still charge you in your valuable time, sprinkling a handful of short ads into your show. But to those used to watching broadcast television, the number of ads will come across as paltry: most half-hour shows have about three 15-30 second ads that you can’t skip (not including the brief 10-second bumper at the beginning); full-hour shows up that to five spots and a feature-length movie goes up to nine or so. That’s nothing compared to broadcast television, which regularly shows that many or more per commercial break. Every once in a while Hulu will also give you the option to watch a longer (60-90 second) commercial at the beginning of the show, in exchange for which you get the rest of the show ad-free. In fact, I kind of wish that came up more often, since I can easily do something else while the ad is showing and then enjoy the remainder of the show uninterrupted. While the ad-supported model of Hulu hasn’t really undergone any changes in the last year, one place that the site has made some improvements is in the area of quality. While the videos on Hulu were always watchable (and usually better than the kind of fare offered at YouTube), iTunes’s standard-definition videos left them in the dust—and now Apple's added HD content to the mix. Hulu has added the option to watch shows in high-resolution 480p format. Hulu, however, wasn’t sitting idly by. The service has added their own HD option, though at a resolution of 480p (that’s 480 horizontal lines), it still falls shy of iTunes’s 720p resolution. That said, 480p looks pretty darn good, even at full-screen, and it’s a nice improvement over the standard resolution that Hulu offers (though I have to admit I find the bigger difference is the HD version's sound—it’s much better than the audio on standard definition). Not all of the shows and movies on Hulu are available in HD, though. Of course, with Hulu being an online venture, you still have to contend with the occasional network glitches. While I've run into videos that stall out from time to time, most of my viewing experiences with Hulu have been overwhelmingly positive. The site's also refined its interface a bit, now offering a variety of easily accessible "channels" built around certain themes like sports, news, and comedy. These channels collect clips, television shows, and movies related to the theme. Likewise, "spotlight" sections provide collections of video about a certain topic, such as the election, or fall television premieres. Watching videos remains pretty much the same as last year, as have the sometimes confusing lists of related videos that are often organized in less useful fashions, such as episodes ranked by popularity instead of how recently they appeared. Overall, though, the site's search usually makes it easy to find the show you're looking for. Like I said, Hulu and iTunes really only look like competitors at first blush. Actually they’re complements—like listening to the radio and listening to your iPod. Most television watchers don’t want to shell out money (and, increasingly, hard drive space) for every episode of every television show they watch. Likewise, those who want to catch a recent Saturday Night Live skit may not want to watch the entire show (and really, who can blame them?). In cases like those, Hulu is an ideal solution. But if you want to take your video with you on the plane or in the car, it’s still going to be iTunes for now. And while iTunes also lets you watch your shows on your big-screen TV via your Apple TV, there’s no similar solution for Hulu, aside from plugging your computer into your TV—an option that leaves something to be desired when compared to the convenience of the modern video-watching experience. But YouTube has made people increasingly accustomed to watching video on their computer screens and Hulu ably takes advantage of this burgeoning trend. A year from now, it wouldn't surprise me to find more people than ever watching television on the Web, probably most of them via Hulu.